If you're dying to look like King-Koopa-a-la-Dennis-Hopper from the awful Super Mario Bros. movie for some strange reason, here's your chance. I'm just going to get this out of the way: I loved the live-action Super Mario Bros. movie. Not because it was good or anything - it wasn't - but because I was a kid when I saw it, and kids are pretty damn stupid. That said, if you have a hankering to look like the film's interpretation of King Koopa - who was not an evil fire-breathing turtle like the Bowser we know and love but rather a sleazy-looking business type in a snakeskin suit - you can now live out those wildest childhood dreams. Movie memorabilia auctioneer Julien's Live has one of the costumes worn by actor Dennis Hopper - and his stunt doubles - up for grabs to the highest bidder. A charcoal colored two-piece faux snakeskin distressed costume worn by Dennis Hopper in the production of the motion picture Super Mario Bros. (Allied Filmmakers, 1993). 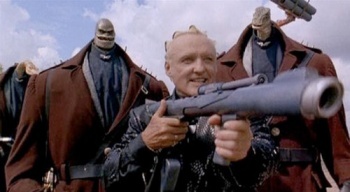 Hopper played the character King Koopa in this live action film version of the Nintendo video game. The top is marked "Stunt" in silver ink, while the pants are marked "Hero". Costume is in fragile condition. Accompanied by a copy of the film. Acquired from Rob Burman, the prosthetic makeup designer on the film. As if the costume itself weren't hideous enough, it seems that Julien's has chosen to sweeten (?) the deal by throwing in a copy of the movie, too. The suit is expected to sell for $400-$600. That's a small price to pay for owning a piece of videogame-based movies' terrible, terrible history.